I don't know about you but I am very nosey! 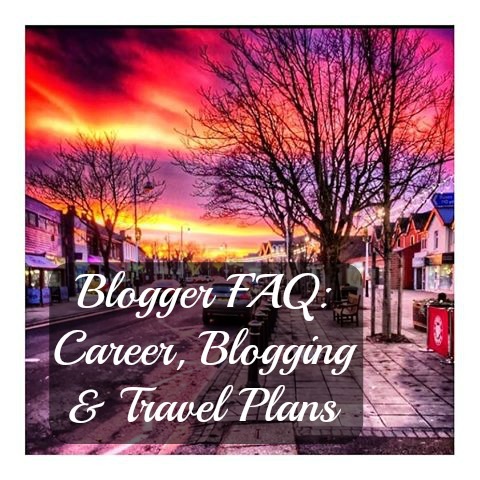 I love finding out about the bloggers/youtuber's I follow and sometimes there are questions I'd like to know about bloggers but they're never addressed so I thought I'd make the effort to address some questions that I get asked about myself; blogging and my career. I hope you enjoy! What made you choose the events industry as a career path? To be quite honest with you I'd never really thought about going into Events as a career. I always new I wanted to go to University but originally thought it'd be to do a Business degree as that was my favourite subject at School and I was good at it. However, when it came to applying for courses I found that the grade boundaries were quite high for me personally and I was worried I wouldn't get the grades. I started to explore different options and my mum had always said I'd make a good PA as I'm a very organised person and we both stumbled across the Event Management courses. It kind of stemmed from there and I am SO happy I chose to go into that industry. Prior to applying to University I did a lot of volunteering with various event companies to get a taste of the industry and some valuable experience and then went from there. I have now graduated with a first class degree and have secured my first events job with a charity in Leeds so I am very excited for the future within the events industry and the beginning of my career. When did you get your first events job and how did you go about it? Do you have any tips? I got my first events job after University in May 2016 for a charity based in Leeds. I have written a post all about how I tackled the job search along with some tips and tricks but basically the main tip is to search early and don't give up. Don't sell yourself short because you are worth it and any company would be lucky to have you join their team. Obviously it goes with out saying that my dream job sits within the events industry; that's a given but ideally I would LOVE to work within the blogging industry too. My dream is to be able to blog full-time whilst running and organising blogger events throughout the UK. Any blogging PR companies needing someone with events industry insight? Hit me up!! I know it's a cliche but definitely my mum and dad. They work so hard all the time and have always taught me to go out there and follow my dreams. They keep me grounded and have always told me to just do my best. I love them very much! How do you feel about people knowing about and reading your blog? At first I tried to keep it a secret as I was worried what people might think of it and the whole idea of blogging but now I don't care! I love doing it and am passionate about my little hobby and if anyone has a problem with it they can quite frankly f**k off!!! In terms of my blog, I just try and get inspiration from other blogs and seeing their success helps to keep me motivated. Tbh, if I didn't enjoy it then I wouldn't bother blogging but because I love it so much I actually miss it when I am not on form so I suppose the fact I love it so much helps with my motivation. When it comes to my career my motivation is looking at event industry experts at the top of my industry and aspiring to be like them. Again, as I said before my mum and dad are my biggest inspirations and are always motivating me to be the best person I can be in everything I can do! When did you decide to become a beauty, fashion & lifestyle blogger? I started my blog during my Placement year at university (2013). I'd been following blogs and youtubers for years prior to that and was feeling a bit lonely living in Manchester, living on my own and not really knowing anyone in the city so in order to pass the time and find a hobby I decided to give it a go and I've not looked back since. I absolutely love this community and would tell anyone event considering it to go for it. Even though an increase of followers is amazing and what a lot of people start blogging for, just doing it and enjoying writing is enough to give it a go. What's the worst that could happen? If money was no object, what would your dream holiday be? I think probably the cliche Bali/Maldives. I have always wanted to go but think it would be the perfect holiday for a honeymoon or an anniversary. Something a bit more exotic but tranquil. I will go one day. It's a goal. Do you like the idea of packing up your bags and going off travelling for a long period of time? This one is a difficult one. I do, and I don't. I would love to be able to but I feel like for me I want to establish my career and do travelling by saving up my holidays and going away to luxurious places. I don't think I could hack living with random people in a hostel for such a long time. I know that makes me sound so stuck up (I'm not, I've done the whole hostel thing and I loved it! ), but just not when I'm travelling the world. Where is your next travel destination going to be? Hopefully Santorini. I want to go back SO bad. I used to go when I was younger but would love to go back with my boyfriend Jay and experience it as a couple. Soon!! !